By the time Ron Stallworth, the subject of Spike Lee's BlacKkKlansman, infiltrated the KKK, he'd already been on the inside of a less-than-welcoming institution: The Colorado Springs Police Force. This isn't to say that Lee's incendiary, gripping, and extremely entertaining film suggests that the cops and the Klan are equivalent. But he does show, in frank and realistic ways, the challenges minorities face in navigating white spaces. 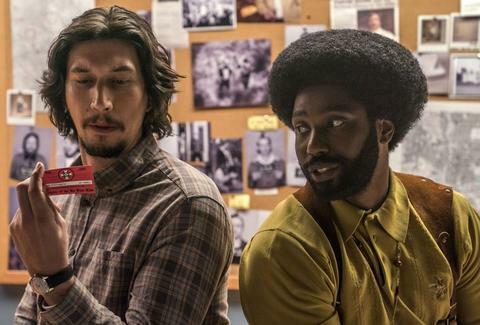 BlacKkKlansman is based on a true story, and it's something of a doozy. In the early 1970s, a young black detective disguised his identity and made contact with America's most notorious hate group, starting an investigation that thwarted violent attacks and also exposed two men in critical Department of Defense positions. I haven't read Stallworth's book, so I don't know precisely how much of Lee's movie is fact versus dramatization, but I do know that the movie is absolutely terrific. John David Washington (yes, Denzel's son) initially plays Stallworth as a somewhat unknowable character. Perhaps it's because Stallworth doesn't quite know the best way to become a part of an all-white; he's eager to be the Jackie Robinson of the upscale Colorado Springs PD, and the racial microaggressions he receives from some of his colleagues don't seem to bother him, and he blows off steam with some rather amusing kung fu moves. Ron befriends a fellow detective, Flip Zimmerman (Adam Driver), when they're ordered to secretly record a Stokely Carmichael-led rally at a black student union. Stallworth is on the job at the rally, but he's also interested in what Carmichael has to say about entrenched racial power structures. Furthermore, his chat with the student union leader Patrice (Laura Harrier) isn't exactly pure business, either. Stallworth makes contact with the KKK by chatting them up over the phone, but when the time comes to meet IRL, he enlists Flip to be his "face." Flip, we discover, is Jewish. Adam Driver, the actor, is not, which I think is important, because Stallworth observes that he's "passing" -- Flip denies the categorization, but once he realizes just how much antisemitism lurks in his own city, it gives him pause. Stallworth and Flip soon form a dynamic duo of anti-racist cops, which in 2018 is enough of a paradox to add to the headspinning title, and their scenes together are extraordinary. When the most loathsome, violent of the KKK goons has Flip in his sights and accuses him of being secretly Jewish, Stallworth swoops in and saves the day, and does it in a way that doesn't blow the investigation. As the story continues, the pair make contact with David Duke, the National Director of the Klan -- Topher Grace plays the odious, slimebag Duke with the perfect amount of naturally repellent superiority -- leading to a final stretch of rising conspiratorial action. Some of this portion may unfortunately become red meat for the "Cinemasins" crowd, as there are, put bluntly, some beats that either make no sense or feel a little too convenient. The montage at the end is breathtaking and left the Cannes audience in stunned silence, which preceded an avalanche of cheers. This wasn't a "liberal love-in," this was a denunciation of hate and a rebuke against those who do not join in that denunciation. In some cases, it really is black and white.